The executions marked by this series could have been the antechamber to a hecatomb for they brought the United States and Spain to the brink of war in 1873 … a war that would be averted through diplomatic wrangling. The occasion also marks the midpoint of Cuba’s correctly named Ten Years’ War, a revolution that sought to extract Cuba from the Spanish empire. * This revolt failed, but it set the stage for more fruitful attempts to come. At the time, the romance of revolution in the air had attracted sympathies internationally including in the United States. One of these enthusiasts was an American named John F. Patterson, who bought a former Confederate blockade runner, the Virgin, and rechristened her Virginius. Patterson put the speedy sidewheel to work supplying the Cuban rebels, an operation that reminds of antebellum American filibustering expeditions against Cuba — operations which would have been very recent history at the time. The Virginius was a pirate ship in Spanish eyes, meaning her crew played a very dangerous game. 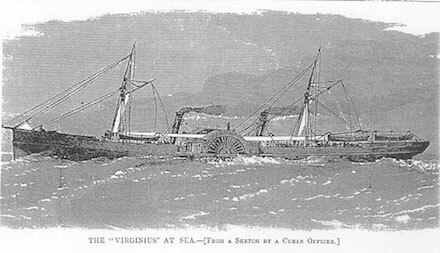 On October 30, 1873, a Spanish warship spied the Virginius as the latter approached Guantanamo, and captured her after an eight-hour chase. She was heavy with weapons and ammunition (which were dumped overboard during the chase) as well as Cuban rebels (which were not). No event that has transpired during the past ten years had produced such a unanimity of sentiment in this city as the recent wholesale butchery of the passengers and the crew of the Virginius … The horrid details of that atrocious affair have aroused a feeling of indignation in the minds of all, the whites and the blacks, democrats and Republicans, and … the members of the various religious denominations. Spain’s rough and speedy disposition of the blockade runner’s human personnel might have more than done for casus belli, but Spanish President Emilio Castelar and U.S. President Ulysses Grant showed keen to avoid the conflict and negotiated a deft diplomatic resolution instead. It amounted to Spain turning the heavily damaged ship back over to the U.S. (the Virginius foundered while being towed back to American shores) while an American investigation ruled that Patterson’s ownership of the vessel had been illegitimate and she had not been entitled to fly the stars and stripes, which defused the official pulled-down-our-colors outrage being invoked by American patriots to justify a belligerent response. Spain also paid indemnities to the U.S. and to Great Britain for the executed people who were nationals of those countries, albeit only after a couple of years’ foot-dragging. The Virginius affair is largely forgotten today but the Grant administration’s recognition of its problematic naval inferiority** in this near-war not only saved the day but spurred American construction of updated ironclads. The results were the U.S.S. Puritan and Amphitrite-class monitors — ships that would take part in the Spanish-American War at the end of the 19th century. * A notable casualty of the war that has graced these grim annals already: eight Cuban medical students shot together in 1871 and still national martyrs to this day. ** Under the heading of “Our Flimsy Fleet” the Nov. 14 Daily Graphic noted that “while the American navy makes an imposing show on paper, it is really far inferior in numbers and efficiency to that of Spain,” featuring just two ironclads in the North Atlantic “better fitted for harbor than sea service” to go with “decayed wooden frigates, unseaworthy monitors, and vessels that for a dozen years have been rotting on the stocks.” They made an embarrassing contrast to the “monster” Spanish frigate Arapelis that happened to be then in dry docks in New York.